Posted on 11/11/2009, 10:00 pm, by sweets4ever, under Randomly Spotted on the Galactic Interweb. 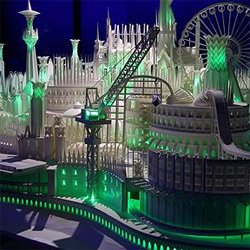 Origami artist, Wataru Ito, created this astounding cityscape with nothing but paper, glue, a craft knife and a hole punch. After four years of crafting, he intends to burn it to nothing but ashes. He plans to video the process and play it backward, so he can see it rise from the ashes. Wow! Do you think you could burn a creation that took you four years to complete? That is beautiful! I wouldn’t be able to burn it down though. This is AMAZING, i dont think i will, its like 4 yrs going up in smokes, i need some thing more just that pictures to remind me and what iv been doing for the past 4 years.